Want to save time and increase your productivity and profits? Take a look at today’s oscillating tool selection. Since affordable oscillating tools first hit the market in the mid-1990s, they’ve evolved into some of the most versatile, efficient and timesaving portable power tools for contractors. From specialty detailed cuts to aggressive demolition cuts -- whether it’s trim or a truss, a doorjamb or stud, or even a long rip-cut in plywood -- these do-anything tools are up to whatever task you throw at them. An oscillating tool can do the work of several tools fast just by using the right blades. They are efficient time savers and will help you complete multiple jobs in less time. That means more growth for your business and more money in your bank account. Take this example: With an end-cut blade attached, an oscillating tool can trim door casings and jambs when installing new wood or tile flooring. It’s also ideal for cutting PVC or copper plumbing pipes. An Extended Life wood & nail plunge cut blade with bi-metal teeth works great for removing nailed-on trim, clipping rusty nail heads from used lumber, cutting aluminum thresholds to length or plunge cutting holes in wood up to 1-5/8 inch depth. Use a semicircle saw blade to make plunge cuts in walls and ceilings. This is handy when you’re installing electrical boxes and vents, or patching drywall. Switch to a rigid scraper blade to remove blistered paint or take rust down to bare metal. Use the same blade to scrape caulk from around bathtubs, sinks, backsplashes and windows. Or get hardened adhesives off vinyl flooring or carpeting. Clamp on a carbide semicircle blade to remove old or pitted grout from between floor and wall tiles, including kitchen backsplashes. This accessory makes a precise cut without scratching tiles. Change to a triangular sanding pad and sanding sheets for detail sanding in corners and tight spaces. When you choose an oscillating tool, consider the Rockwell® F80 DuoTech Oscillation Sonicrafter®. This 4.2-amp oscillating multi-tool is a top-performer that provides dual oscillating angles: 5.0º for fast, aggressive cuts and 3.4º for continuous control. It’s powered by a 4.2 amp motor with electronic speed control that handles a maximum cutting load of 35 lbs. That means your blade won't stall and shift shifting under pressure. The F80 incorporates Rockwell’s Universal Fit™ system, so you can use other major brands’ accessories on Sonicrafter multi-tools without adapters. Likewise, Rockwell’s own universal accessories are manufactured to fit all other multi-tool brands. All Sonicrafters feature a spring-loaded centering mount that positively engages accessories. Your blade slippage problems are a thing of the past with Hyperlock™, a convenient, tool-less blade change system that provides one ton of clamping force to ensure accessories stay put during use. 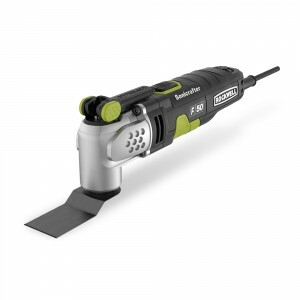 The Rockwell F80 4.2-amp Oscillating Multi-tool (RK5151K, $159) includes 10 accessories and a hard carrying case. It comes with a three-year warranty. Find it at rockwelltools.com and online retailers like Lowes, Home Depot, Menards and Amazon. Article and photo provided by Rockwell Tools for networx.com. What Do Football and Home Improvement Have in Common?